Solar-powered water splitting is a promising means of generating clean and storable energy. A novel catalyst based on semiconductor nanoparticles has now been shown to facilitate all the reactions needed for "artificial photosynthesis." In light of global climate change, there is an urgent need to develop efficient ways of obtaining and storing power from renewable energy sources. The photocatalytic splitting of water into hydrogen fuel and oxygen provides a particularly attractive approach in this context. However, efficient implementation of this process, which mimics biological photosynthesis, is technically very challenging, since it involves a combination of processes that can interfere with each other. Now, LMU physicists led by Dr. Jacek Stolarczyk and Professor Jochen Feldmann, in collaboration with chemists at the University of Würzburg led by Professor Frank Würthner, have succeeded in demonstrating the complete splitting of water with the help of an all-in-one catalytic system for the first time. Their new study appears in the journal Nature Energy. Technical methods for the photocatalytic splitting of water molecules use synthetic components to mimic the complex processes that take place during natural photosynthesis. In such systems, semiconductor nanoparticles that absorb light quanta (photons) can, in principle, serve as the photocatalysts. Absorption of a photon generates a negatively charged particle (an electron) and a positively charged species known as a 'hole," and the two must be spatially separated so that a water molecule can be reduced to hydrogen by the electron and oxidized by the hole to form oxygen. 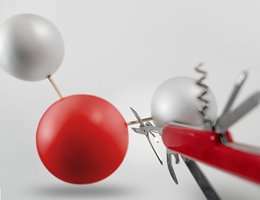 "If one only wants to generate hydrogen gas from water, the holes are usually removed rapidly by adding sacrificial chemical reagents," says Stolarczyk. "But to achieve complete water splitting, the holes must be retained in the system to drive the slow process of water oxidation." The problem lies in enabling the two half-reactions to take place simultaneously on a single particle – while ensuring that the oppositely charged species do not recombine. In addition, many semiconductors can be oxidized themselves, and thereby destroyed, by the positively charged holes. "We solved the problem by using nanorods made of the semiconducting material cadmium sulfate, and spatially separated the areas on which the oxidation and reduction reactions occurred on these nanocrystals," Stolarczyk explains. The researchers decorated the tips of the nanorods with tiny particles of platinum, which act as acceptors for the electrons excited by the light absorption. As the LMU group had previously shown, this configuration provides an efficient photocatalyst for the reduction of water to hydrogen. The oxidation reaction, on the other hand, takes place on the sides of the nanorod. To this end, , the LMU researchers attached to the lateral surfaces a ruthenium-based oxidation catalyst developed by Würthner's team. The compound was equipped with functional groups that anchored it to the nanorod. "These groups provide for extremely fast transport of holes to the catalyst, which facilitates the efficient generation of oxygen and minimizes damage to the nanorods," says Dr. Peter Frischmann, one of the initiators of the project in Würzburg. The study was carried out as part of the interdisciplinary project "Solar Technologies Go Hybrid" (SolTech), which is funded by the State of Bavaria. "SolTech's mission is to explore innovative concepts for the conversion of solar energy into non-fossil fuels," says Professor Jochen Feldmann, holder of the Chair of Photonics and Optoelectronics at LMU. "The development of the new photocatalytic system is a good example of how SolTech brings together the expertise available in diverse disciplines and at different locations. The project could not have succeeded without the interdisciplinary cooperation between chemists and physicists at two institutions," adds Würthner, who, together with Feldmann, initiated SolTech in 2012.